It was 2003 and I had just finished my Veterinarian School at Texas A&M. I was lonely and wanted to get a canine companion to cherish for years to come. I preferably love to have large dogs, like Labradors or German Shepherds, dogs who I can train with. I was anxious for a dog, one that would hold a true friendship with since me and a friend had broken apart. So, I looked towards my local shelters that I had printed out from Google Maps. I went to each dog cage in every since of those six shelters but didn’t find anything. When I reached the last shelter all the way in Austin, they led me to my last hope for a friend. As I approached the last cage, it had four dogs hopping up looking as cute as ever to get my attention, but they didn’t. I bent down and looked through to see a pudgy, old, dachshund corgi mix staring in my eyes with brown ones. It was love at first sight. I adopted her (I had to wait four days–96 crazy hours), and heard her terrible history. Several people came, 6 to be exact, to adopt her. Each one bailed on her and never came back. When I examined her fur, I knew her previous owner had abused her according to the cuts spreading her fur apart and when I petted her she backed away. Sure she was no running dog, but she belonged with me. At first I thought it was bad because she was an old dog. She couldn’t climb the stairs, she was afraid of the broom and would hurt herself jumping from the sofa. Her teeth rotted (the few she had left), she was going deaf and she was beginning to go blind. I felt I would lose her but I knew that she would last. She lasted seven years. Soon she had gotten used to it, but one day I had to hurry to work. The terrifying moments of when I felt a bump when I backed the car. I have never forgiven myself for the dreadful moments my memories have held. I have a wooden toy dog I had received for Christmas when I was a child. It had wobbly, aged, red plastic wheels, the brown paint wearing off and chips all over it. I named it Sweetie in her honor and remember her. Sweetie was the only orange dog I will ever have. Everyday I stare at her wooden urn on the mantel and pet her fur clippings and say “God Bless Thy Sweetie Mae”. Some say that I had an Angel Dog, and some say she will stay in my heart forever, but she was more than that. 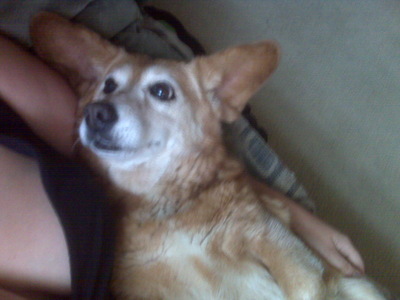 She was the orange, old, funny, furry, speckled corgi dachshund. My, orange, old , funny, furry, speckled corgi dachshund. All Mine.